Summary: A rewarding viewing experience, but in the end it’s little more than an exquisitely crafted travelogue laced with an overwhelming sense of missed opportunity. Prolific British filmmaker Michael Winterbottom continues to cross genres, and now timelines, with Code 46, an exploratory story of doomed love set some years into the future. The widespread use of human cloning has redefined every aspect of society. Suddenly the likelihood of sleeping with a cloned version of your Nan is a distinct possibility and an individual’s right to self-improvement is judged on the quality of their genes. Earth’s geographical borders have given way to a biologically-motivated division between the haves and have-nots. Those fortunate enough to populate the cities are legitimised by papelles; genetic ID cards that insure against becoming one of the disenfranchised millions who roam the contaminated wastelands on the outskirts of modern society. 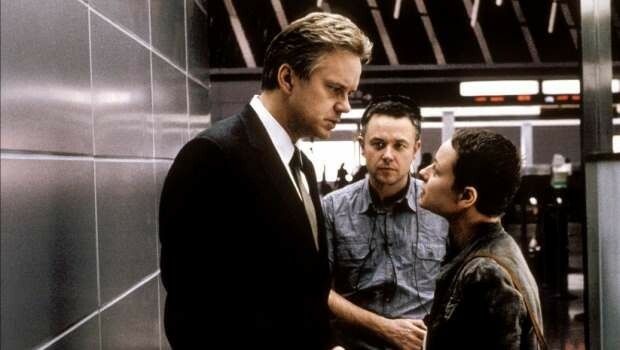 When fraud investigator William (Tim Robbins) travels to the mass mega-sprawl that is Shanghai (brought startlingly to life entirely on location) to look into a case of phoney ID trafficking he becomes captivated with the prime suspect Maria, played by Samantha Morton. In the role of the classic femme fatale transposed, Maria’s seduction of William not only throws him off the scent, but causes him to shrug off his responsibilities, both professional and familial, to cover up her illegality. But in a world where guilt is more than skin deep, their illicit love becomes more damaging than either of them could have forseen. Code 46 has a sensibility derived from the more high-brow ascendants of the science fiction genre. It is interrogative of the direction mankind is headed, and as such shares more in common with say 2001 than Star Wars; that’s not to say that there are any spaceships flying about; the futurism is subtle, but derivative. In a deliberate effort to keep the budget down, Winterbottom uses the ultra-modern conurbations of Shanghai and Dubai as a suggestive backdrop, much in the same way as Jean-Luc Godard used post-war Paris in his neo-noir masterpiece Alphaville. The clean open spaces catalyse William and Maria’s doomed affair, injecting all the suffocating loneliness and alienation that characterises the individual’s relationship with the city. A palpable sense of irony, derived from Greek tragedy, embeds itself in the noirish landscape. A sensual, dream-like pacing to the film recalls Andrew Niccol’s Gattaca, and emphasises the kind of somnambulistic feeling you get from long-haul travel. Winterbottom’s future feels like one big airport departure lounge; a neutral space where cultural trappings are stowed away at the departure gate, and people can sleepwalk their way through life. In a prescient trick stolen from Blade Runner, a new global language that incorporates English, French, Spanish and Chinese proves further evidence that the boundaries that demarcate our lives in the present are set to be dissolved. Code 46 seeks a kind of geography of the body and mind in its central relationship to burn brightly amidst the shackling hegemony of this anonymous future world. Unfortunately the lack of on screen chemistry between Robbins and Morton crucially lets the dramatic element of the film down and thus reduces the entire enterprise to little more than a sumptuous mood piece. There isn’t enough at stake emotionally to draw you into the story and the relationship becomes lost and confused amidst the awesome visual scale. High on atmosphere, low on drama, Code 46 washes pleasantly across the senses, and remains a rewarding viewing experience, but in the end it’s little more than an exquisitely crafted travelogue laced with an overwhelming sense of missed opportunity.